- Publisher Now available in leather. Since its release in March 2002, "Hope for Each Day" has climbed the CBA bestseller list, shipped over 250,000 copies, and enhanced the record-setting sales of the already successful Daily Devotional series. - Publisher In keeping with the spirit of Max Lucado's "Grace for the Moment," Charles Swindoll's "Wisdom for the Way," and John MacArthur's "Truth for Today" comes the latest edition into the Daily Inspirations series. 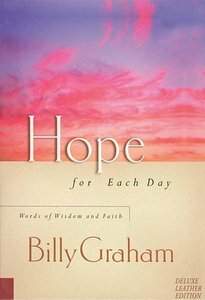 In "Hope for Each Day," Billy Graham offers spiritual comfort to guide us through our daily lives. Rev. Graham is a national treasure and has counseled numerous political leaders and provided comfort in times of public crisis. About "Hope For Each Day"
Now available in leather. Since its release in March 2002, "Hope for Each Day" has climbed the CBA bestseller list, shipped over 250,000 copies, and enhanced the record-setting sales of the already successful Daily Devotional series. Customer Reviews For "Hope For Each Day"
365 Uplifting Stories...this is so good! A must have! This is one more reason (out of the many for sure) why America considers Billy Graham a national treasure. This 400 pages heavy book is filled with wonderful stories. Each day, you can read a short essay that can help start your day with inspiration. Surprisingly this book has a calming effect and can give you a sort of peace in the midst of everyday chaos.